Pharmacists are being allowed to prescribe antibiotics for people with sore throats in a bid to cut the amount of the drugs being given out. Cwm Taf and Betsi Cadwaladr health boards are running the pilot scheme. In six weeks, Betsi Cadwaladr had 390 consultations, resulting in 55 people getting antibiotics. Treorchy pharmacist Adrian Fraser Jones said: "The prescribing of antibiotics is high - Cwm Taf is especially high, so we need it to be less." Of the 390 people who visited a pharmacist in Betsi Cadwaladr, 86% did not need antibiotics but 351 people said they would have gone to a GP. Just over 400 people used the service in the Cwm Taf area and about 75% did not need antibiotics. The health board said 90% of the patients indicated they would have gone to a GP if this project was not in place. About 70 pharmacists are taking part and Mr Jones said he carried out two or three of these tests each week. 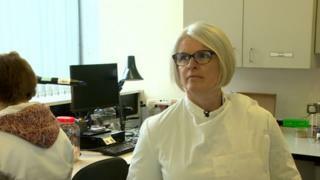 Image caption Pharmacist Adrian Fraser Jones said health boards needed to cut "unnecessary prescribing of antibiotics"
Dr Eleri Davies, from Public Health Wales, said the results of the pilot would be studied before a decision would be made on expanding the scheme. She added: "It is increasingly important that we get the diagnosis of infection correct, before antibiotics are prescribed and the pilot work going on. "Testing for the causes of sore throats and other diagnostic tests that are now increasingly being used in general practice are a good way forward to improve our diagnosis of infection, and to focus our use of antimicrobials." Cwm Taf started running the scheme in November, with Betsi Cadwaladr following in mid January. Clinical director of medicines management at Cwm Taf, Suzanne Scott-Thomas, said: "We are very pleased with the initial findings of this pilot and will be considering commissioning in more community pharmacies across the health board in time for next winter. "This service supports primary care in freeing up more time in GP practices so that sicker patients can be seen and also supports the appropriate use of antibiotics."